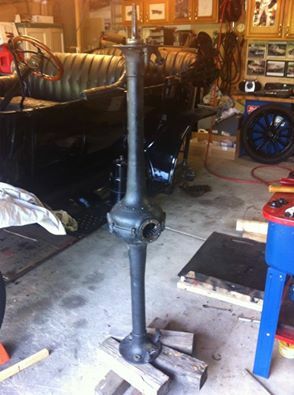 Model T Ford Forum: Ok for a Horizontal Rear Axle Rebuild? Ok for a Horizontal Rear Axle Rebuild? 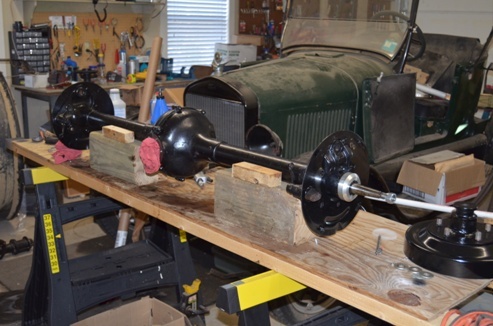 Model T Ford Forum: Forum 2014: Ok for a Horizontal Rear Axle Rebuild? 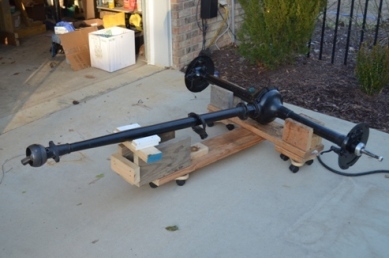 After watching Steve Jelf's excellent tutorial rear axle rebuild, I am about ready to reassemble mine but I don't have a nice jig to rebuild it vertically. I have plans to assemble it on the floor- any issues with doing it in this manner? I have to assume it'll also make setting the thrust washer steel plates easier to set on the pins. Are there any issues with assembly in this fashion? Just take a good piece of 2 X 12 and cut a circle smaller then the diameter of the center with a slot in it just big enough to slide the axle out when your done. 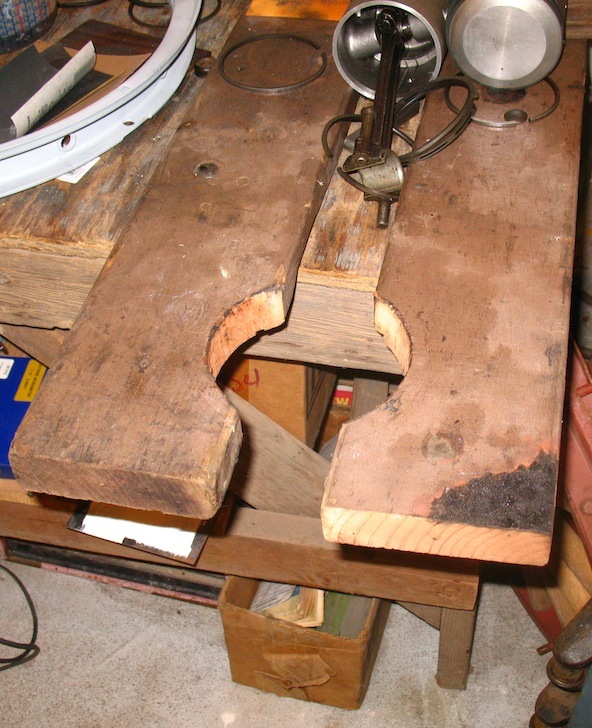 C-clamp it to a good work bench and your in business. Quick question- once the axle is vertical, how does one get the top thrust washer plate (with the holes) to line up while upside down? Oh, works best if you can put C-clamps in the back to counter the weight of the rear end. 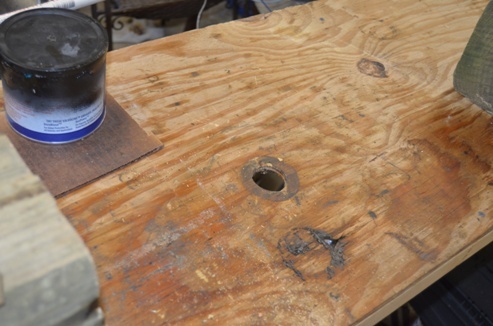 Length of the bench plus the hole for housing. Or you could drill a couple of holes and bolt it down. Grease holding it to the housing! Nothing fancy here. A pair of 2x6 scraps and four carriage bolts. I used a 2X12 cut as Mark said and set it between a two ladders. Gave me a fixture for the axle assy and a place to lay parts and tools. Clamped the board to the steps. Don't have a photo but think you can get the idea. Also, put a piece of plywood across two saw horses. Cut a 2" hole in the plywood so I could set the differential assy vertical and work it before I put it in the housings. Also used the plywood bench to do the final stuff with the axle assy horizontal. Also got some three wheel roller from Harbor Freight and made the push cart to move the drive line assy back under the T.
I took my '15s rear axle apart, had gears put on two new axle shafts, and put it all back together on two sawhorses in my basement last winter. No problem, just heavier 'n hell dragging it up out of the basement. Thank goodness for the Bilco doors!! I didn't know he made doors. What limited my wok day was how many times I could pick up the assy vertically and drop it into the 2X12. 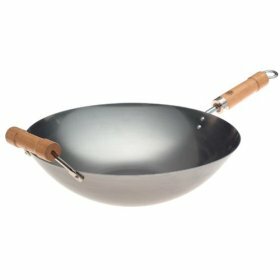 You have a whole day set aside for woks? Didn't have the needed wood and was itchin to get it done- so tah-dah, did it vertically with large planks on the floor. Worked!